The complex plane (also called the Argand plane or Gauss plane) is a way to represent complex numbers geometrically. It is basically a modified Cartesian plane, with the real part of a complex number represented by a displacement along the \(x\)-axis, and the imaginary part by a displacement along the \(y\)-axis. The motivation behind the complex plane stems from the fact that a complex number, in its essence, is just an ordered pair of real numbers. So any complex number can be given a concrete geometric interpretation as points on a plane. The complex number \(a+bi\) can simply be represented as the point on the Cartesian plane with the coordinates \((a, b)\). 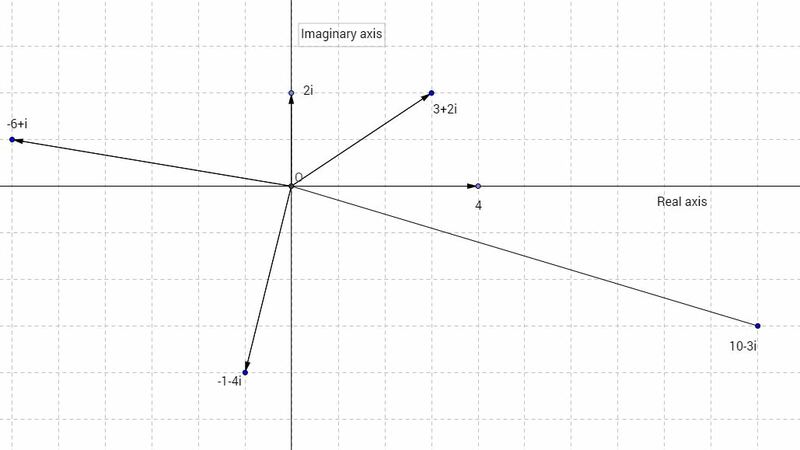 This gives us a way to deal with complex numbers visually, which has a lot of advantages. Adding or multiplying complex numbers can be viewed as geometric operations on points (or vectors) on the plane if we represent complex numbers this way. As we said earlier, the complex plane is basically a modified Cartesian plane where the \(x\)-axis and the \(y\)-axis have been dubbed the "real axis" and the "imaginary axis," respectively. Here we can see several complex numbers plotted on the complex plane. The complex plane is sometimes called the Argand plane because it is used in Argand diagrams. These are named after Jean-Robert Argand (1768–1822), who was an amateur mathematician and a keeper of a bookstore in Paris, although they were first described by Danish land surveyor and mathematician Caspar Wessel (1745–1818).